Definition at line 402 of file CNormalTranslation.h. Definition at line 6352 of file CNormalTranslation.cpp. References CCopasiNode< _Data >::getChild(), and mpNode. Definition at line 6385 of file CNormalTranslation.cpp. Referenced by CNormalTranslation::has_duplicate_nodes(), CNormalTranslation::newCancel(), and CNormalTranslation::newEvaluateNumbers(). Definition at line 6390 of file CNormalTranslation.cpp. Definition at line 6361 of file CNormalTranslation.cpp. References CCopasiNode< _Data >::getChild(), CCopasiNode< _Data >::getParent(), CCopasiNode< _Data >::getSibling(), and mpNode. Definition at line 6395 of file CNormalTranslation.cpp. Definition at line 6400 of file CNormalTranslation.cpp. Definition at line 405 of file CNormalTranslation.h. 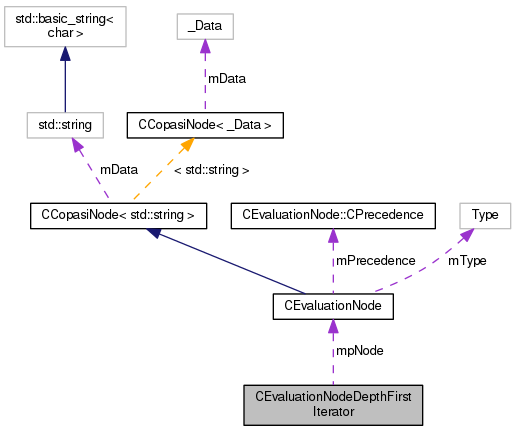 Referenced by CEvaluationNodeDepthFirstIterator(), isValid(), operator*(), operator++(), operator->(), and operator=().